Waking up at 5+am to catch a flight isn't easy nowadays. The joke between my travel companions - Ms Sumo and Ms Tiny Gal that the budget airline would probably be delayed. So, we should just not arrive too early. Luckily, we didn't arrive late. Unlike our previous trip, Tiger Airways depart on time this time. Low Cost Carrier has definitely made travel cheaper. The beauty is, we could buy a separate one-way ticket, with the flexibility of choosing the schedule and price. Our return airticket cost us about $300 including taxes. It's almost 40% savings from my first trip to Hong Kong, some 8 years ago, where my return CX tickets cost me $500+. The only downside is there's no aero-bridge and one has to climb up the stairs to the plane. Probably not suitable for my old folks. Catching a different view of the sky. Day 1: Morning Arrival. Afternoon - High Tea at Intercontinental Hong Kong. Night - Shopping around Mong Kok. Day 2: Morning - Breakfast & Ferry to Macau. Upon arrival, Check-In to Galaxy. Explore Galaxy Macau Hotels & Resort. Evening - Explore Taipa Village & Dinner. Day 4: Morning - Yum Cha at Lin Heung Tea House. Walk around Central. Late Afternoon - Depart for Lamma Island for seafood. Day 5: Morning - Breaksfast & start journey to Tai O. Evening - Explore Citygate. Night - Temple Street. 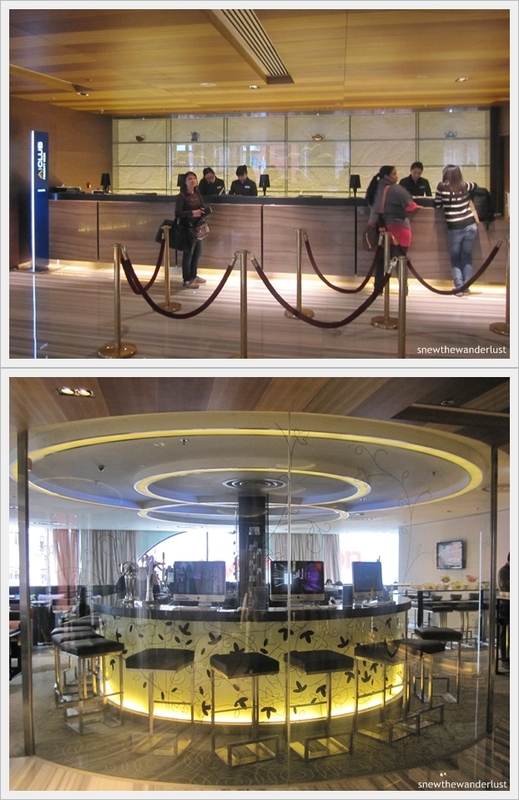 A modern looking 4-star hotel located just minutes away from the Jordan MTR Station. 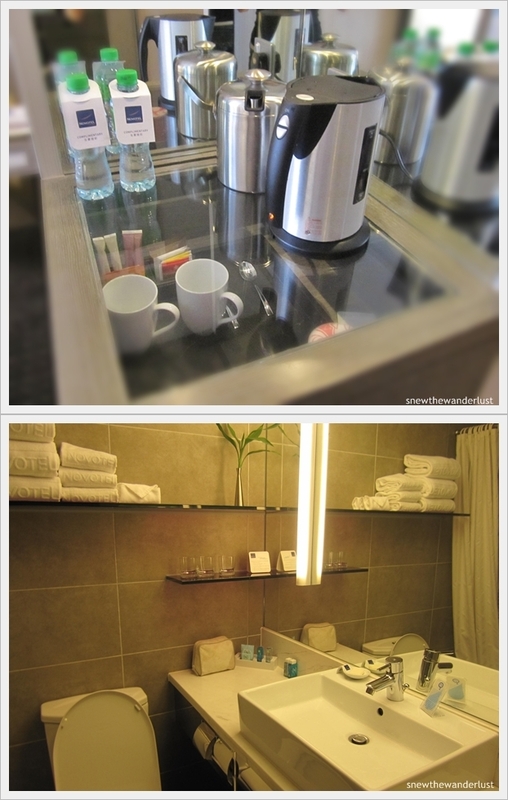 It's conveniently located within walking distance (just opposite Temple Street Night Market). The bedroom was a bit of a disappointment, as it was too small to fit the three of us. We have arranged for triple-sharing, although the hotel doesn't have this policy. It just make no sense for one of us to get another room. Housekeeping has to remove the sofa to make-way for the additional bed. Well, Hong Kong hotels are known for it's small size. Couldn't really complain. Something strange that I wonder. From the window of our hotel room, I saw this messy view from the opposite old building. There's obviously someone still using the roof top to dry their linen. Why didn't they just clear up the roof top to make it less eye-soar? 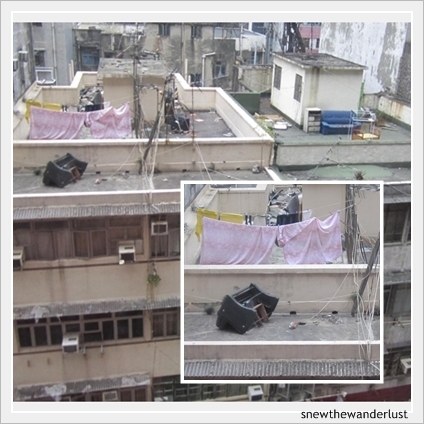 What makes me wonder is why the old sofa would end up on the ledge of the rooftop? Could it be typhoon that has made the sofa landed it there? It's just so close to dropping down. What if there's another typhoon and hmm... accidents do happen. I shall not think about it. Other than the size, the hotel is nice. Service is also prompt whenever we ask for something.